Know Your Rights When You Vote Tuesday, November 6, 2012! You are here: Home / Civil Rights & the ADA / Know Your Rights When You Vote Tuesday, November 6, 2012! People with disabilities have the right to vote! Everyone needs to vote this year, including voters with mental disabilities. If you are a voter with a disability, you should know your rights. Knowing your rights will help make sure you can vote. Take this piece of paper with you when you go to vote so that you know what your rights are. You can also show this to others if you run into any problems. This flyer tells lawyers and poll workers where to find the laws that protect your right to vote! You do have the right to vote! If you are a person with a disability and understand what it means to vote, Federal law guarantees your right to vote. The law that gives you that right: The Americans with Disabilities Act, 42 U.S.C. § 12132; Doe v. Rowe, 156 F.Supp.2d 35 (D.Me.2001). You have the right to get help from a person you choose. If you can’t read or need help voting because of your disability, you can have someone help you vote. You can bring a friend, family member, or someone else you trust. You can also ask the poll worker to help you if you didn’t bring anyone with you. If you have a problem, you can get help by calling 1-866-OUR-VOTE. Lawyers are available to give voters with disabilities and other voters advice and help with voting problems, so call 1-866-OUR-VOTE (1-866-687-8683). The law says everyone gets to cast a ballot, so don’t leave without voting! Even if someone says you cannot vote, the law says the poll worker must allow you to vote a Provisional Ballot. Later, an election worker will determine whether you are qualified to vote. If you are, your vote will be counted. 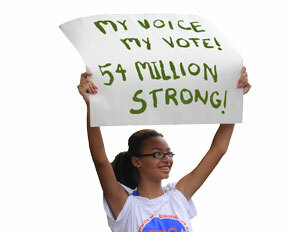 For more information about the rights of voters with disabilities, visit www.ndrn.org. After you vote, the National Council on Disability, in collaboration with the National Disability Rights Network and EIN SOF Communications, Inc., wants to hear from you about your voting experiences during the 2012 election. Take their survey online. The survey is also available as a Word document.